Home > Used Vehicles > 2016 Lexus RX 350 CERTIFIÉ LEXUS, COMME NEUF! You must see this super clean 2016 LEXUS RX350 in person! Only one owner. Rare color combination of Caviar Black on Noble Brown leather. 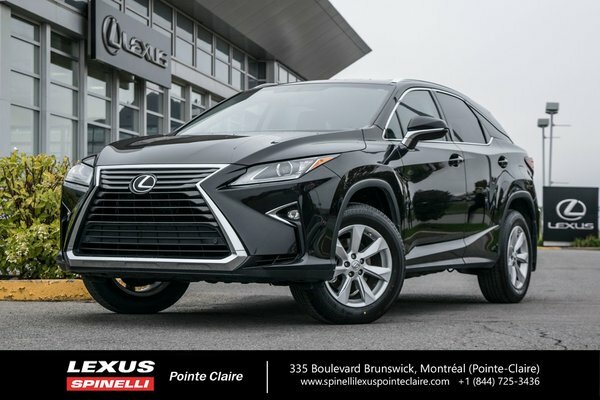 This beautiful luxury SUV was purchased new from Spinelli Lexus Pointe-Claire and has 74 132 on the odometer and has been reconditionned to almost new condition. Carproof vehicle history report and LEXUS Canada maintenance history report are available. This RX 350 warranty also protects it until March 29, 2022. On the spot financing is also available. A CERTIFIED LEXUS mechanical inspection has been performed. Only a Lexus dealer can certify a Lexus. New brakes (pads and rotors), brand new 4 season tires, oil and filters, wipers, wheel alignment, full tank of gas, and more. Over $3000 invested so you won't have to! This very clean RX 350 is superbly equipped with 18'' alloy wheels, leather interior, heated seats, heated steering wheel, power tilt and telescopic steering wheel, power sunroof, back up camera, memory driver's seat, and much more.